In 1992, the Henry County Baptist Association began to respond to the residential needs of families with developmentally disabled adults. We began with the generous gift of a home, associational commitment, and a partnership with Hope Tree Family Services (formerly the Virginia Baptist Children's Home and Family Services) Developmental Disabilities Ministry. Countless hours of volunteer service and donations led to the renovation and furnishing of the home. Twice each year, major races are held at the Martinsville Speedway. Volunteers from our churches serve by providing race fans an opportunity to worship, enjoy Christian music, and discover the message of Christ. Bring a Kid to the Race Day, held in the spring, typically draws an attendance of 1,000 young people and children. Volunteers serve in our Ministry Tent where they give out free refreshments, distribute tracts, and share their faith. Another facet of Raceway Ministries is to transport people who need assistance to and from the track in golf carts. Pastors donate their time by serving as chaplains. For more information on Raceway Ministries, call the HCBA at (276) 638-2951 or click here to visit their website. Henry County Baptist volunteers continue to be a part of this ministry. HCBA's goal was to purchase a disaster relief trailer and stock it with tools to take along whenever they went on an assignment. That became a reality in the fall of 2008. Diaster volunteers are trained and stand ready to go at a moment's notice to help prepare food for and speak a kind word to the people who have gone through a disaster such as a hurricane or a large storm that leaves destruction in its path. 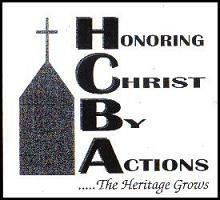 If you are interested in becoming a part of this ministry, call the HCBA at (276) 638-2951. The Evangelism ACTeam strives to be a resource for the HCBA churches in the association. "Share Jesus Without Fear" is a tool used in learning to share one's faith with the "lost and dying" of this world. The area youth ministries are growing through the strong leadership of local youth pastors and youth leaders. Many ministries such as See You at the Pole, True Love Waits, World Changers, Centrifuge, and other local ministries are being done to show our students that they need to hold on to Jesus as tightly as they can and connect with other Christian students so they will have a network of believers. The senior adults of the HCBA meet three times a year (April, July and September) at one of the local churches for fellowship, food and entertainment. For the September meeting we have a "Talent Showcase" from our member churches. Several trips are planned throughout the year for the senior adults, including both one-day and multiple-day trips. The HCBA music ministry prepares music for the annual meeting held in the fall. In addition, all churches are invited to be part of a musical worship service exalting God and lifting His name on high through music. The HCBA is in partnership with the food pantry of One Accord Baptist Church where no one has to go hungry. Applicants, when approved, receive a box of food items. Between 600 and 800 families receive food each month. On October 12, 2013, several churches in our association participated in Operation Inasmuch in a joint project with the Pittsylvania Baptist Association. Volunteers in our churches did mission projects for people in our community. We have another association-wide Operation Inasmuch event planned for October 11, 2014.